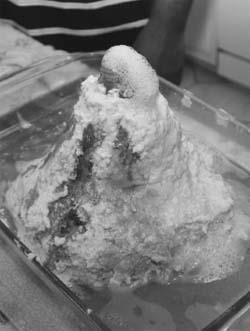 How can I make a volcano from vinegar and baking soda? This is a classic chemistry experiment that you might have done before in school. 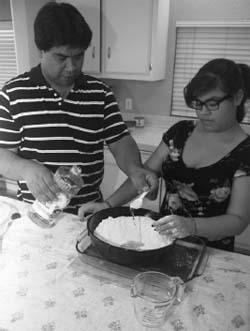 In a large bowl, first mix 6 cups of flour, 2 cups of salt, 4 tablespoons of cooking oil, and 2 cups of water. Mix these ingredients until they are firm. These ingredients are not involved in the chemical reaction that will make your volcano erupt, but rather this mixture will serve as the “rock” that forms the structure of your volcano. Place the plastic bottle standing vertically in the pan. Use your hands to shape the “rock” material from the first step into a cone shape around the top of the bottle. Be careful not to cover the top of the bottle. Fill the bottle most of the way with water, leaving enough space to add a few ounces of baking soda and vinegar. Add a few drops of dishwashing soap to the bottle. This is not part of the chemical reaction that will take place inside the bottle, but bubbles from the soap will help to catch the gas evolved during the reaction between the vinegar and baking soda. Add 2 tablespoons of baking soda into the bottle.